This one day workshop, held in the “motor city” of Birmingham, UK, a centre of car production and of expertise about (auto)-mobility, brings into conversation historians and social scientists who investigate the histories, politics, and social, visual and aesthetic meanings of (auto)-mobility, primarily across the Middle East but also in global and comparative perspective in the twentieth and twenty first centuries. A transformative phenomenon of the twentieth century, (auto)-mobility in its various incarnations globalized unevenly after World War One, altering a variety of social practices and inflecting the wider dynamics of production and consumption. From new roads, production lines and showrooms, to traffic jams, garages, advertisements, car accidents, joy riders and (counter-) insurgency techniques, to name just a few salient aspects, motorized vehicles and the conditions they provoked altered conceptions of time, senses of place or authenticity, and the production of space. Our title makes use of parenthesis advisedly, since regardless of whether people took the wheel, loitered at the curb, hitched a lift or crossed the road, (auto)-mobility transformed practices of gender, class, and domesticity, most notably, though not exclusively, in urban and suburban contexts. (Auto)-mobility also refigured international and regional dynamics in contexts such as pilgrimage, even as national road networks worked to produce national space, and urban roads re-segregated newly ‘historic’ inner cities and downtowns from suburbs that became both gated communities and laboratories for religious and political organization. 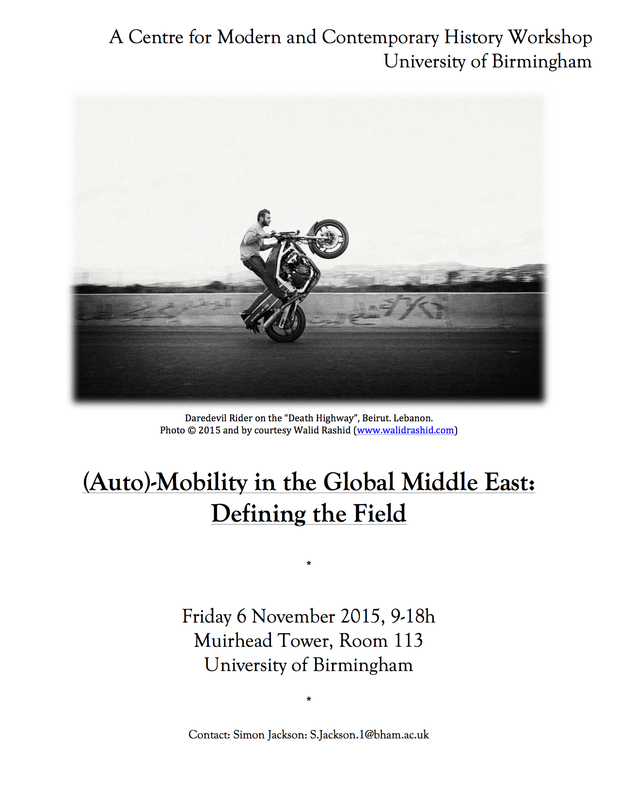 Via a case study or a historiographical intervention, participants will present their evaluations of the state of this burgeoning field as part of wider (auto)-mobility studies, and will engage in debate on its potential and future direction, whether as scholars of the Middle East or of other sites and networks of (auto)-mobility around the world. 13:30-15:30h: Panel 2: Urban (Auto)-mobility between History and Social Science. 17:30-18h: Concluding Discussion and Planning for 2016 Conference. 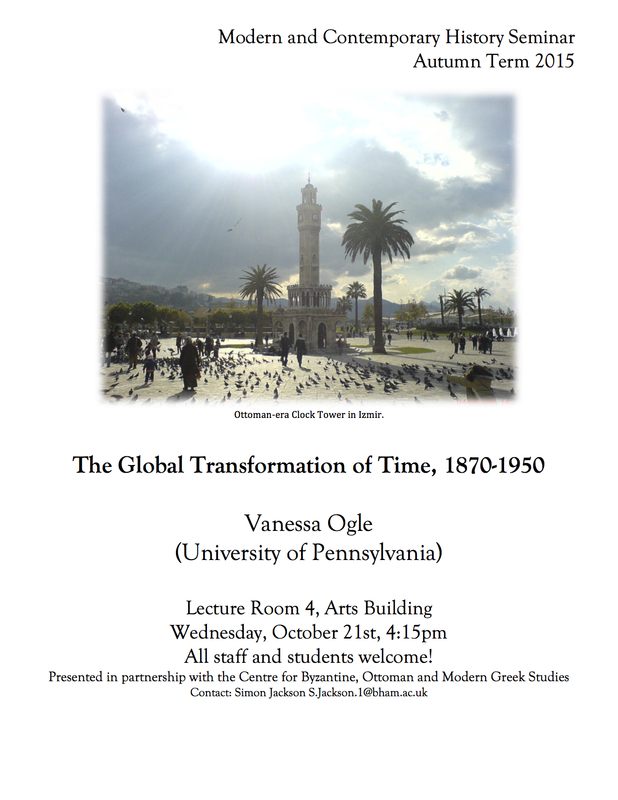 This week’s guest post comes from our Modern & Contemporary research seminar speaker, Vanessa Ogle (University of Pennsylvania), who will present her work at the Centre on Wednesday 21 October at 16:15h. 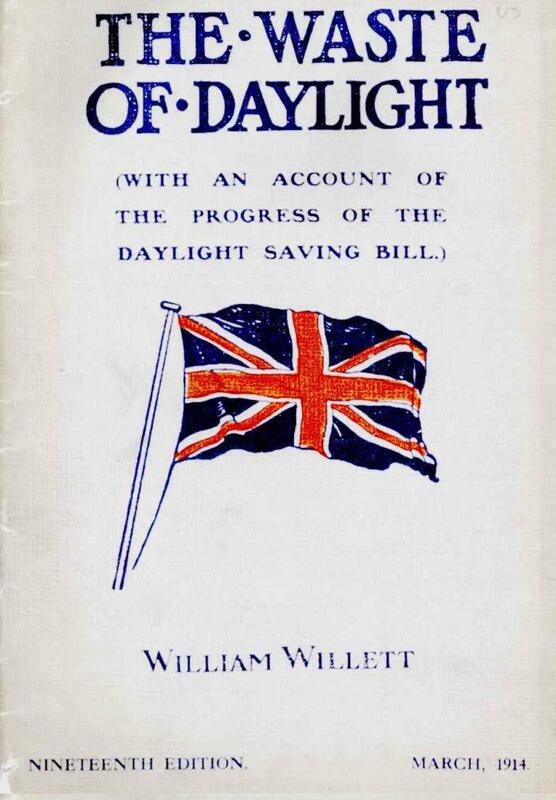 Cover of William Willett’s pamphlet “The Waste of Daylight” 1914. Courtesy, Vanessa Ogle. As new networks of railways, steamships, and telegraph communications brought distant places into unprecedented proximity, previously minor discrepancies in local time-telling became a global problem. In my forthcoming book, The Global Transformation of Time, I chronicle of the struggle to standardize clock times, calendars, and social time from 1870 to 1950 and highlight the many hurdles that proponents of uniformity faced in establishing international standards. Yet clock times and calendars were not only concepts that were standardized and internationalized during the nineteenth century, like so many other subject matters and movements during the same years. Time also had a more foundational role to play in nineteenth-century globalization. A globalizing world led contemporaries to reflect on the annihilation of space and distance and to develop a global consciousness. In his famous Imagined Communities, Benedict Anderson argued that print products and newspapers in particular, made it possible for dispersed audiences to conceive of themselves as belonging to the imagined community of a nation. Yet what Anderson did not see was that new means of communication and transportation encouraged contemporaries to imagine their nations and societies in the world, and to view them as members of a global community of nations and societies. Time – historical, evolutionary, religious, social, or legal – served as the backdrop against which to imagine this global community, by comparing nations and societies and situating them in universal time. Time established the hierarchies that separated ‘advanced’ from ‘backward’ peoples in an age when such distinctions underwrote European imperialism. Time thus became a universal language in which to make sense of an interconnected but heterogeneous world during the age of empire. Time’s role as such a universal metric meant that a surprisingly wide array of observers commented on varieties of time. Around 1900, the result was a striking simultaneity of ‘time talk’ around the globe. Involving German and French government officials, British social reformers, colonial administrators in Africa and Asia, Indian nationalists, Arab reformers, Muslim scholars, and League of Nation bureaucrats, such exchanges about time often heightened national and regional disparity. For several decades, countrywide mean times were introduced first and foremost with national and regional concerns in mind. Germany introduced GMT+1 as “Central European Time” – Mitteleuropäische Zeit. “Mitteleuropa” was a designation drawn from the emerging discipline of geopolitics and denoted Germany’s ‘middling’ position on the continent as covering, at least in aspiration, much of the space between France in the West and Russia in the East. In the colonial world, mean times were applied late and often designed for regional purposes. Half-, quarter, and even twenty-minute differences rather than even hours were therefore the norm rather than the exception. The standardization of clock times hence remained incomplete as late as the 1940s, about sixty years later than normally assumed. The much sought-after unification of calendars, entirely overlooked by existing research, never came to pass. The Global Transformation of Time reveals how globalization was less a relentlessly homogenizing force than a slow and uneven process of adoption and adaptation that often accentuated national differences. If we cannot figure out how to properly test car emissions, we might as well give up on regulating forests, factories or garbage dumps. After all, cars ought to be ideal targets for environmental regulators. They’re largely standardised – most look and act more or less the same – and they’re produced by the thousand or million. Test one Volkswagen Polo and you should have tested them all. In theory. Yet it hasn’t worked like that in practice. A month after the VW scandal broke most eyes are still on the German carmaker and its plunging shares, the desk clearing in management, and its hectic efforts at retrofitting. Fewer people are reflecting on what the scandal means for our system of environmental governance. This is missing the bigger story. In a way, the emissions scandal shows there is a difference between clever cheating and dumb cheating. By its own admission, Volkswagen tampered with the car’s software in order to get good emission figures in testing mode. This is dumb cheating, especially if you get caught: it’s clearly against the rules. But what if car manufacturers and regulators agree on a set of rules for testing that could deliver good figures for fuel efficiency? It is widely known that cars achieve notably better mileage per gallon on the test stand than in everyday practice. In fact, the difference has increased dramatically in recent years: according to the International Council on Clean Transportation, the NGO whose emission tests led to the fall of Volkswagen, the gap between official and actual carbon dioxide emissions in new European cars grew from 8% in 2001 to 40% in 2014. Such a divergence is clearly misleading customers and the general public, but it’s not illegal. That’s smart cheating. Das going to cost you. Standard setting on environmental matters is a murky area that few people bother to enter. Scientific results may provide some guidance, but there is always room for interpretation, and many rules and regulations are negotiated behind closed doors. The botched numbers for fuel efficiency are a good occasion to take a closer look. Is this the power of the automobile industry at work? Is this about lazy bureaucrats whose principal aim in life is to be out of the office at five? Or maybe it is about a third party such as the facilities that do the actual testing? Negotiations over test procedures are inherently boring, but they matter a lot. If the upcoming Paris climate summit finally seals a deal on global warming, it will all be about numbers, and there will be endless worries if we can no longer trust them. Thanks to standardised mass production, cars should be one relatively simple part of a global system of emissions regulations. If we cannot secure reliable numbers here, we are in trouble when it comes to forests, soils, and other parts of the biosphere. The trouble with test procedures is particularly disturbing since there really is not much room for debate. It is obvious that numbers should be accurate and that tests should reflect the real world. It’s also clear that an independent authority should certify the rules. The Volkswagen scandal indicates the industrial economies of the West cannot sustain that kind of independence anymore. When today’s framework of environmental governance evolved in the 1970s, the general idea was that environmental ministries and other government bodies would serve as a counterweight to the vested interest. Now it turns out that the presumed watchdog is curiously reluctant to bark. A lot has been written over the last month about the loss of trust, but it’s really a matter of institutions rather than morals. Maybe we need a watchdog for the watchdog? Volkswagen has shown the huge toll of dumb cheating, but the scandal also suggests the risk of getting caught was not significant. The story only broke because of a study that worked with a grand total of three cars, two of which happened to be Volkswagens. A cash-strapped NGO could not afford to cast a wider net, and it was a matter of luck that it made the right choices. No system of environmental governance can rely on these kinds of coincidences. 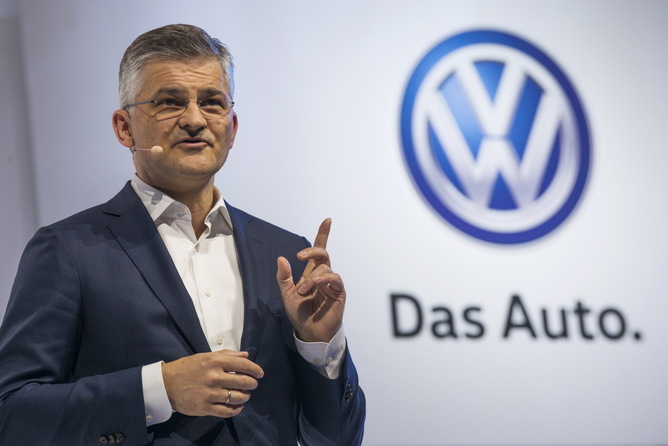 Volkswagen’s managers are red-faced, but that will be a temporary thing. They will either change their corporate culture, or there will be no more Volkswagen managers. Whether regulators are red-faced is anyone’s guess, but they certainly should be embarrassed. The question is whether anyone bothers to look them in the face. The Week 4 Modern and Contemporary History Research Seminar is on Wednesday 21 October 2015, at 16:15h in Arts Lecture Room 4 (LR4). This week’s guest post comes from Dr. Silvia Salvatici, Associate Professor of Contemporary History at the University of Milan. She writes on post-war societies, women refugees, gender and human rights, and European displaced persons in the aftermath of WWII. Here she introduces some new research on the history of global food security, a topic connected to the Modern & Contemporary History Centre’s upcoming winter roundtable, on 4 December, on the theme “Disentangling the World: The Politics of Autarky after the First World War“. 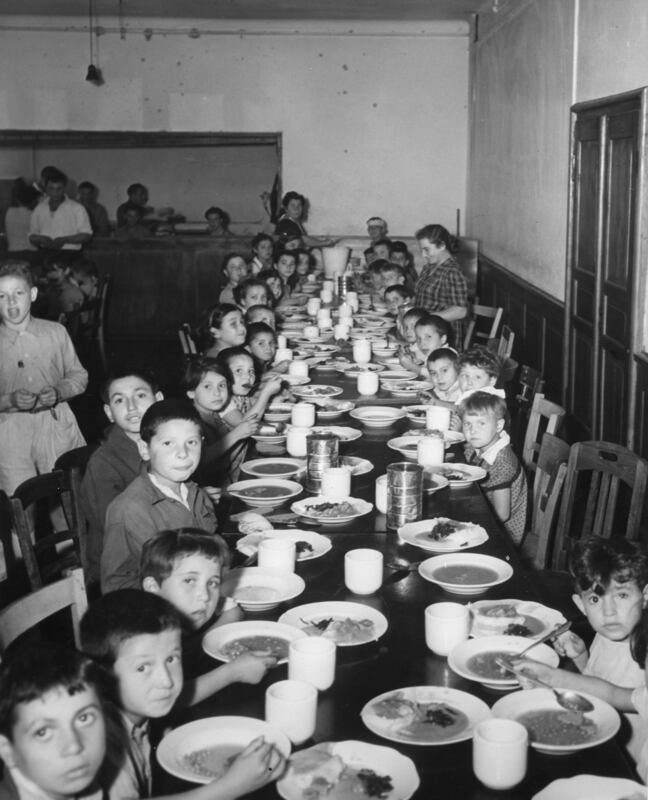 DP children in Rosenheim, Germany, 1946, pictured before beginning their evening meal. National Archives and Records Administration, USA, 260-MGG-1062-08. Photo courtesy of Silvia Salvatici. In 1993 the authors of a bibliographic survey conducted for the Institute of Development Studies noted that in the literature “there is no single definition” of food security “but rather a complex weave of inter-related strands, which are adjusted to suit the needs and priority of individual users”. More than twenty years later, this assertion still seems to hold true, in spite of a proliferation of studies that have opened up specific areas of research across a variety of disciplines linking food security to processes of globalization, environmental issues, human rights and individual crisis regions. The absence of any “single definition” and the presence of different sets of “priorities of individual users” reveal how varied and complex the scholarship is, but they also provide an important opportunity to historians seeking to interpret the measures deployed in the past to combat hunger and malnutrition. The expression “food security” itself, for example, entered current usage in the early nineteen seventies, when the international community was forced to deal with an unexpected dearth of agricultural products on markets and a food crisis afflicting the world’s poorest regions. In recent years historical studies have been mainly concerned with the meanings attributed to the idea of food security – even if this wasn’t always the expression used – and on how those attributed meanings led to initiatives to alleviate food insecurity. Adopting a variety of perspectives and chronologies, such studies have drawn attention to the many different players and principles involved in determining food needs and the measures aimed at satisfying them. One of the main streams of scholarship has viewed food security as a matter for global governance and it has looked at the role assumed by international organizations in this regard. In line with this approach, a number of studies have identified the period following the Second World War as a transitional phase, when food security began to be addressed as a separate issue within the United Nations with the setting up of the Food and Agricultural Organization (FAO, 1945) and later the World Food Programme (WFP, 1961). The end of the Second World War has, thus, come to be seen as the beginning of a period that ushered in contemporary food policies. How these policies subsequently unfolded has itself now become a topic of special interest for scholars. Accordingly, the articles of a recent special issue of the journal Contemporanea: Rivista di storia dell’800 e del ‘900 devoted to “Food Security in the Contemporary World” all focus on global food policies during the second half of the twentieth century. They analyze the institutional framework represented by the United Nations, the ideology of development, and the role of food security in international relations as connecting threads during the decades that followed the end of the Second World War. However, like many recent studies, this special issue considers 1945 less as a departure point and more as a pivot that needs to be contextualized within a longer chronology, including both the interwar years and the time after the Second World War. In fact, an important cluster of studies has emphasized how the idea endorsed by the United Nations – that food security was a matter for concerted global governance – was already visible in the earlier activities of the League of Nations. Studying food security as a matter for global governance allows us to trace extended chronologies and identify new turning points, and to this end the history of international organizations (IOs) can offer useful insights. However, the essays in the special issue of Contemporanea show how the role of international organizations can only be fully grasped by looking closely not just at IOs themselves, but at the many players – national governments, non-state actors, experts – who were involved in designing and implementing measures against hunger and malnutrition. This cluster of studies provides a compelling picture of the current state of the research and it also suggests, we hope, new areas that modern and contemporary historians might begin to explore. M. Smith, M., J. Pointing, and S. Maxwell, Household Food Security: Concepts and Definitions. An annotated Bibliography, Brighton, Institute of Development Studies, 1993, p. 136. Whose postcolonialism? The French and their colonial past. 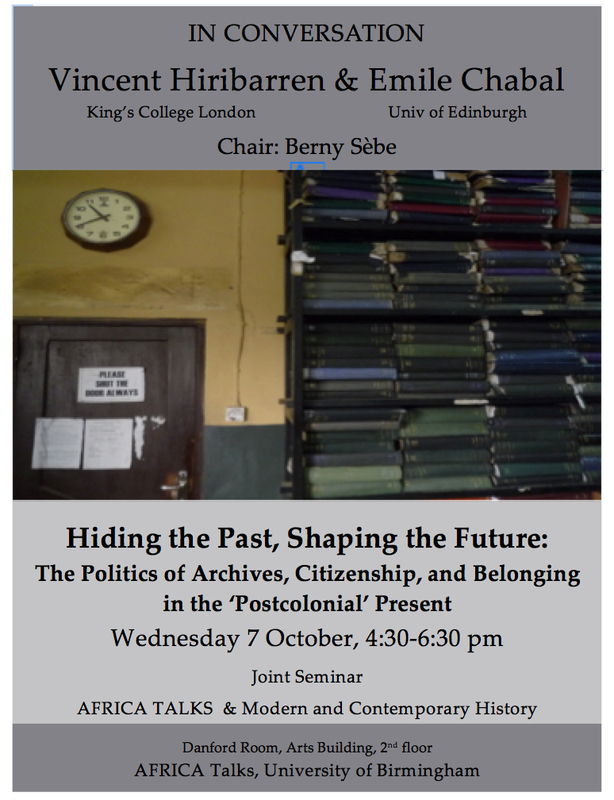 Dr. Emile Chabal will be speaking in a joint event on Wednesday 7 October, co-sponsored by the Centre for Modern & Contemporary History. Here he blogs on some of the themes to be discussed at this week’s seminar, in the first of a series of occasional guest pieces by visiting speakers and contributing historians around the world. 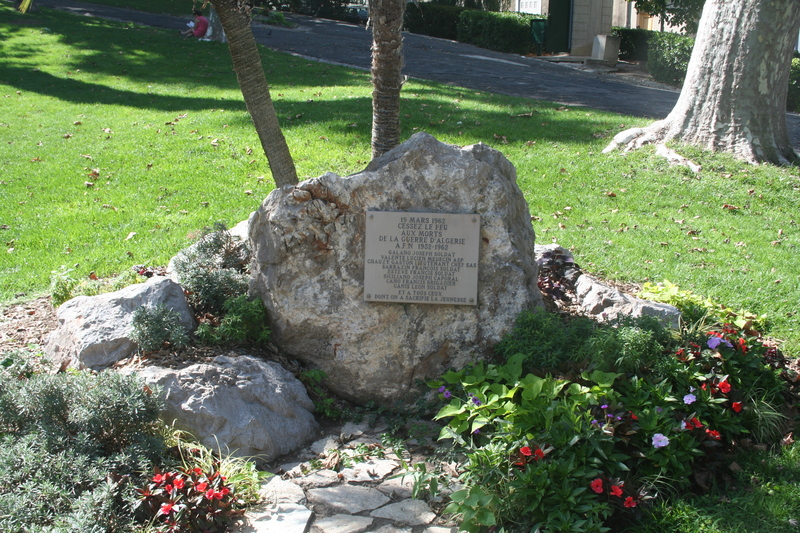 Memorial to French dead in Algerian War of Independence, Sète, France. Photo by Fagairolles 34, reproduced under Creative Commons license via Wikimedia. In my recent book, I place postcolonial questions at the heart of contemporary French politics. I argue that apparently insular debates about citizenship and the nation are, in fact, closely tied to France’s colonial past and its postcolonial present. I also argue that it is impossible to analyse the key dividing lines in French politics without understanding the attitudes of political actors to France’s colonial project. Yet, over the course of my research, I have discovered just how nationally – and linguistically – bounded postcolonialism really is. There is a common misconception that France has not “dealt with” its colonial past and that French academia has been extremely hostile to postcolonial theory. To some extent this is true. Postcolonial studies courses, for instance, are still a rarity in university literature departments in France. But this is hardly the whole story. In fact, one could easily argue that France has had a much more vigorous debate about its colonial past than almost any other country in Europe, especially the UK. Since the late 1990s, issues like colonial violence, torture and the relationship between Islam and the French colonial project have been at the forefront of public debate. Even if we go further back into the 1970s and 80s, postcolonial questions were clearly visible in the identity politics of France’s substantial pied-noir community. So what’s the problem? Why do British and American scholars of France maintain that France has failed to come to terms with its colonial past? The difficulty, it seems to me, is one of definition. Most people would accept that, in North America, the UK and South Asia, discussions of postcolonialism emerged from the disciplines of literary criticism and social theory through the works of Edward Said, Gayatri Spivak and others. By contrast, the genealogy of postcolonialism is quite distinct in France, where it has been local politicians, activists and non-governmental organisations who have grappled with colonialism and its legacy. This means that, while much of the debate surrounding postcolonialism in the English-speaking world has focused on “texts” and “representations”, in France it has focused on street names, memorials, museums, parliamentary laws and issues of historical memory. One of the consequences of this is that postcolonialism has had a much wider reach in France than elsewhere. Instead of being confined to university departments and research seminars, the question of how colonialism should be remembered, what its impact was and what sort of legacy it has left is one that is fought out in the public sphere. There are few better examples of this than a 2005 legislative package which included a clause to ensure that French schools teach the “positive” aspects of colonisation. Predictably, this caused huge controversy. Pied-noir organisations, who had been the driving-force behind the legislation came out strongly in favour of it, while historians and left-wing political organisations lined up to criticise it. Eventually, the offending clause was removed from the legislation by presidential decree, but this did little to stop a far-reaching discussion of French colonialism in every major press and media outlet. The whole affair was a stark reminder that, even though the development of postcolonial ‘theory’ was a distinctly Anglophone phenomenon, the French have been no less engaged with their colonial heritage. It is simply that, as with so many other things in France, the political and partisan aspects of postcolonialism have always been much more prominent than its academic manifestations. It is worth noting, however, that there have been many distinguished Francophone theorists of colonialism (including Édouard Glissant, Aimé Césaire and Frantz Fanon), and that many Anglophone postcolonial theorists were inspired by French thinkers like Jacques Derrida. So, even in this strictly theoretical definition of postcolonialism, the French are present. The Week 2 Modern and Contemporary History Research Seminar is on Wednesday 7 October 2015, at 16:30h in the Danford Room (Arts Building, 2nd Floor) (note change from usual time). We are delighted that it is organized in conjunction with DASA Africa Talks and will be delivered by: Vincent Hiribarren and Emile Chabal, with comments from Berny Sebe. All our welcome and there will be drinks afterwards. Autumn Term 2015 is looking like a great term for research seminars over in BOMGS! 15 Oct, Michael Jeffreys (Oxford): “Women of the Komnenian house under Manuel I, as seen in the poems of Manganeios Prodromos”.